The BP Portrait Award is the most prestigious portrait competition in the world, promoting the very best in contemporary portrait painting. With a first prize of £25,000, the exhibition has proved to be the launch pad for the careers of a number of successful portrait artists. This year's exhibition will present over fifty-five selected portraits, alongside the work of the two BP Travel Award 2007 winners, Timothy Hyman and Gareth Reid. Hyman's studies of a unique group of Indian artists he first met in the 1980s will be displayed alongside Reid's portraits of members of the Scandinavian âvinterbaderklubs' (winter-bathing clubs) who regularly swim in man-made ice holes. On Monday 16 June 2008 the winner of the BP Portrait Award 2008 was announced by Ian Hislop at the National Portrait Gallery. In a record-breaking year for entries from non-UK artists, the prestigious first prize was won by 35-year-old London artist Craig Wylie. His winning portrait, K (oil on canvas, 2100 x 1650 mm), is an epic study of his girlfriend Katherine Raw based on sittings at his Hackney Wick studio. Craig wins £25,000 and a commission, at the National Portrait Gallery Trustees' discretion, worth £4,000. 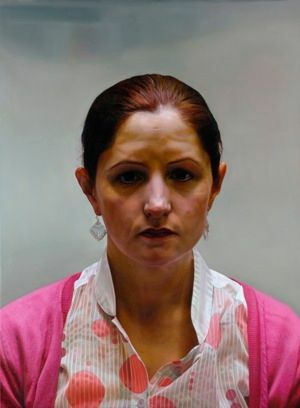 The second prize of £8,000 goes to Simon Davis for Portrait of Amanda Smith at Vincent Avenue and the third prize of £6,000 goes to Robert O'Brien for Hannah O'Brien. There is, also for the second time, a BP Young Artist Award of £5,000 for the work of an entrant aged between 18 and 30. This has been won by Peiyuan Jiang for Untitled. An 88-page book, with an essay by Alexander McCall Smith, accompanies the exhibition, featuring all the selected artists and including the two BP Travel Award 2007 winners. Special Gallery price £7.99 (RRP £8.50 paperback).